UlaanBaatar's air quality is among the worst in the world. Jargalmaa Sukhbaatar is five years old, and she hasn’t been to school in weeks. Her parents are keeping her at home to protect her from the toxic air outside. The oldest of three children, Jargalmaa is a resident of Ulaanbaatar, Mongolia, the world’s coldest capital city and one of its most polluted. During the winter months, when average temperatures can dip below -40 degrees (in both Fahrenheit and Celsius), the air in Ulaanbaatar fills with toxic particles that emanate from the unrefined coal burning inside people’s homes, causing a smog so thick that it becomes almost impossible to see. Forty-five percent of Mongolians now live in the city, and experts say it is overpopulated. As Ulaanbaatar continues to grow and industrialize, the problem has only worsened. The pollution is especially bad in northern districts of the city, where families settle in traditional nomadic yurts, known as gers, and burn whatever they can find to stay warm in below freezing temperatures. Jargalmaa lives in a ger district with her parents, Altantuya and Darambazar, and her younger brothers, 3-year-old Tugsjargal and 6-month-old Tugsgarid. On a freezing January morning, Altantuya, a cheerful woman with her dark hair pulled back in a ponytail, explains that her youngest son never goes outside. He was recently diagnosed with rickets, a skeletal disorder tied to vitamin D deficiency. Her children have already gotten sick three times since autumn—all cases of respiratory infections like the flu or bronchitis—and she plans on keeping the two eldest children out of kindergarten until the cold, and the associated pollution, lessen. She’s not alone. The government of Mongolia recently extended schools’ winter holidays to encourage parents to keep their kids inside, and many families have sent their children out of the city to live with relatives in the countryside. Ulaanbaatar is a city full of children like the Sukhbaatars, for whom daily life is regulated by hazardous levels of air pollution that ultimately affect their normal mental and physical development. And while Ulaanbaatar may be an extreme example, every country on earth struggles with air pollution. Children, especially those under the age of five, are on the front lines of the issue because their bodies and developing brains are uniquely vulnerable. According to the World Health Organization (WHO), more than 90% of the world’s 1.8 billion children are exposed to toxic air pollutants. The problem isn’t evenly distributed: In the developed world, 52% of kids under age five are exposed to dangerous levels of fine particulate matter, tiny pollution particles in the air that are thinner than a single human hair and can travel inside human beings’ respiratory tract and cause various health problems. 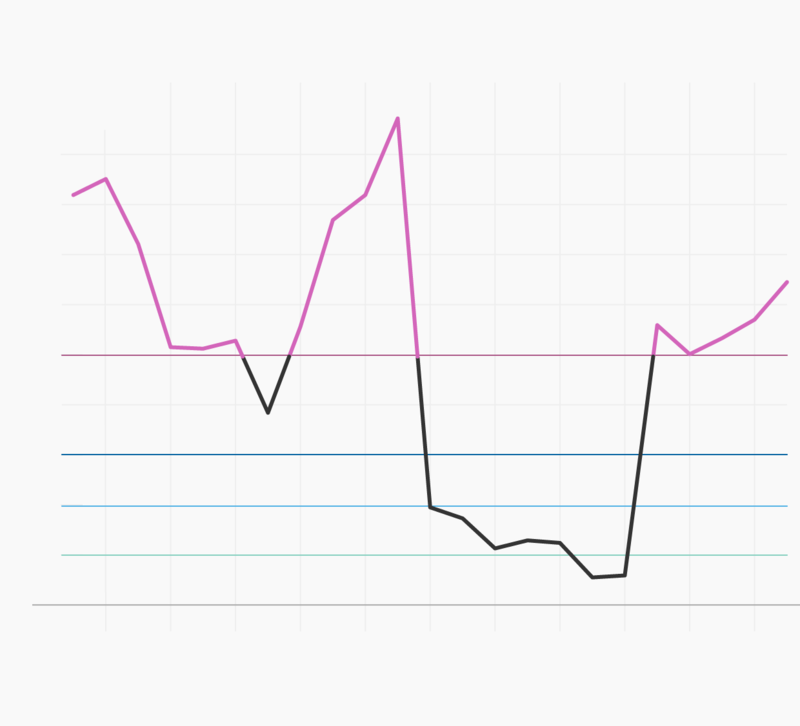 In the developing world, that proportion rises to a stunning 98%. As cities around the world grow, more and more places are being overtaken by toxic air. Ulaanbaatar’s struggle to deal with air pollution exposes the tension between public health and economic expansion faced by many developing countries. But when the cost of doing business is the poisoning of shared resources, it’s impossible for a city’s people to grow and thrive. It’s 9am on a recent Wednesday outside of Kindergarten n° 212 in the Dari Ekh area of Ulaanbaatar, and breathing in air feels like drawing fire into my lungs. I am wearing a certified N99 face mask, which is meant to filter out fine air pollution particles, but it’s itchy and gives me the uncomfortable feeling of having a sheen of mist stuck to the front of my face. I watch dozens of little kids walk into the kindergarten with their parents, either wearing no masks or wearing masks that don’t fit—rendering them essentially useless. The morning air outside is so filled with smog from this ger district’s chimneys that it’s difficult to see, and I find myself fervently hoping that conditions are better inside the school. A portable monitor measures the concentration of fine particles, known as PM 2.5. The monitor says that the PM 2.5 concentration inside the entrance of the kindergarten is 345 micrograms per cubic meter (μg/m3)—a level deemed “hazardous” by international guidelines, at which everyone is at risk for serious respiratory issues. According to World Health Organization (WHO) guidelines, PM 2.5 values shouldn’t go above an annual mean of 10 μg/m3 or a 24-hour mean of 25 μg/m3. These measurements help conceptualize an abstract problem, but experts say they have serious limitations. 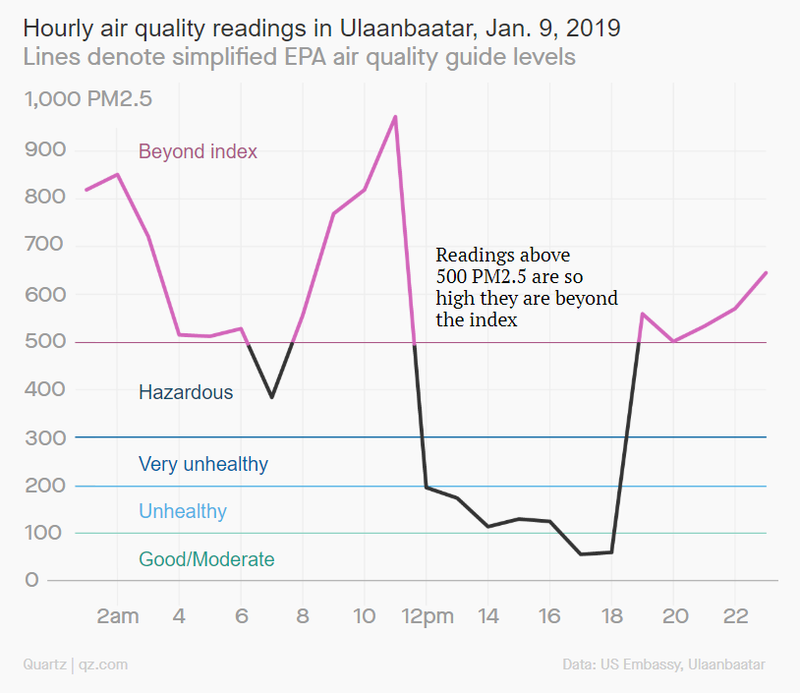 In Ulaanbaatar, where pollution is worst in the early mornings and evenings, fine particle concentrations vary widely throughout the day. Portable monitors are not always accurate, and countries have different standards for what constitutes “safe” air quality. Still, data collected by the WHO and aggregated by The Guardian shows that the annual average PM 2.5 concentration in the city was 75 μg/m3 in 2017—which says very little about how bad pollution levels can get in the winter. According to the United Nations International Children’s Emergency Fund (UNICEF), air pollution levels on January 30, 2018 at 5am reached a staggering 3,320 µg/m³. Air pollution particles harm anyone who breathes them in, but children are the most impacted. First, their exposure levels are higher(pdf): Since they’re smaller, they’re closer to the ground and they breathe more quickly than adults, and through their mouths instead of their noses (which contain a natural filtration system). Children also tend to spend more time outside. And once kids are exposed, the pollutants have a worse impact on their bodies, which are growing and developing at an incredibly fast pace. That’s especially true during the first 1,000 days of life, a time when the childhood brain is building more than one million new neural connections per second. PM 2.5 particles enter children’s bodies through their nose and mouth, pass through their respiratory airways, and enter the bloodstream to reach every organ in their bodies. The particles disrupt the normal functioning of those organs, including by damaging brain cells, and increase children’s risk of developing heart, brain, respiratory, immune and developmental conditions later in life. Air pollution particles “affect the global ways in which the child grows, and this has consequences up to late in adult life,” explains Martinez. Exposure to those particles has been linked to preterm birth and low birth weight, impaired cognitive development in utero, and spontaneous abortion. Intrauterine and childhood exposure to air pollution has also been linked with bronchitis and asthma, reduced lung function, recurring or chronic respiratory conditions, and impaired growth and development. Large-scale studies in Vancouve rand Shanghai found an association, though not a causation, between exposure to particulate matter, nitrogen dioxide, and nitric oxide and incidence of autism. Ulaanbaatar didn’t always face these kinds of health problems. After the fall of the Soviet Union, Mongolia adopted a market-based economy and lifted existing restrictions on internal migration. At the same time, the climate of the country was changing and there were more frequent dzuds, the Mongolian word for severe winters that cause large numbers of livestock to die, making the nomadic herder lifestyle less sustainable. As a result, many people moved into Ulaanbaatar in a massive, unplanned rural exodus that strained the city’s infrastructure and led to the expansion of ger districts in the suburbs of the city. Today, the impact on children is only getting worse in Mongolia. A 2014 study showed that, between winter and summer 2011, rates of fetal deaths increased 3.6 times. Pneumonia is now the country’s second most-frequent cause of death for children under five (pdf). Although air pollution is increasingly problematic everywhere, the situation is much worse in the developing world. Rich, developed cities have shown gains in recent years, while air pollution has worsened in the south and southeast Asian, eastern Mediterranean, or western Pacific regions. A recent analysis of annual PM 2.5 concentrations conducted by Greenpeace found that 22 of the world’s 30 most polluted cities are in India, and that 99% of south Asian cities and 89% of east Asian cities exceeded the annual WHO guidelines. Meanwhile, rich countries continue to outsource some of their pollution to poor countries. A recent analysis published in Nature Geoscience found that “around a third of environmental and social impacts from consumption in wealthy nations is displaced to developing countries.” And smog continues to deepen the socio-economic divide within the world’s most polluted cities, disproving German sociologist Ulrich Beck’s famous observation, in the wake of Chernobyl, that “poverty is hierarchical, smog is democratic.” Those who can afford to leave urban centers or send their children away, do. Those who can pay for air filtration systems or the best-quality medical care are able to avoid the worst of the exposure. And companies step into the gaping hole left by governments with promises of clean air—for a price. There’s absolutely no scientific evidence that drinking a $2 oxygen cocktail has any impact on someone suffering from chronic exposure to air pollution. But people are desperate enough to try it, because more sustainable solutions are hard to find. Dilemmas like these are commonplace for concerned parents in Mongolia. Economic opportunities are very limited outside of Ulaanbaatar, where more than half of the country’s GDP is generated. Many families are forced to make a choice between health and financial security. Davaadulam Jangalsaikhen, a 24-year-old mom in Ulaanbaatar, is seven months pregnant with her second child. She says she would like to leave the city to escape the recurrent sinus infections that have brought her to the hospital regularly over the course of her pregnancy. “If it was possible, I would like to go to the countryside,” she says. Pollution-related health problems are straining Mongolia’s health-care system. UNICEF conducted a financial analysis (pdf) of the country’s health-care system, in collaboration with Mongolia’s National Center for Public Health, and found that in 2016, air pollution-related diseases in children cost public health services in Ulaanbaatar the equivalent of $4.8 million. The researchers found that, if the government fails to act on the pollution problem, treating children between birth and 18 years of age would cost public health services an additional $9.8 million by 2025. That’s money the government can’t really afford to waste. Mongolia’s economy, which relies mostly on agricultural and mineral exports, grew at a very fast pace over the last 25 years, but it suffered heavily from the global fall in commodity prices between 2014 and 2016. In 2016, the country’s budget deficit stood at 20.6% of gross domestic product. That same year, the proportion of the population living below the national poverty line was almost 30%. Given what we know about the effects of severe air pollution on kids’ health, it’s fair to say that “air pollution is…a violation of children’s rights,” explains Alex Heikens, UNICEF’s representative in Mongolia. And while “the only long-term solution is clean energy,” he says there are things the government and its partners can do to reduce kids’ exposure to pollutants and to improve the quality of the medical care they receive. The most significant step the government has taken to tackle air pollution has been to ban the use of unrefined coal in Ulaanbaatar starting in May 2019 and to subsidize electricity for poor households in ger districts at nights. But coal miners are skeptical (paywall) that the ban on unrefined coal will be enforced, mainly because electricity is expensive and most gers are not hooked up to the city’s central heating system. Coal, meanwhile, is plentiful and cheap. The government of Mongolia has also banned internal migration into Ulaanbaatar until 2020 in an effort to limit the number of people contributing to the air pollution problem: More people means more traffic jams, overcrowded schools, and electricity shortages. And in 2016 and 2017, officials laid out additional plans to tackle air pollution. Among other things, the government vouched to build more sustainable and “green” urban settlements; plant more trees in the city; and decrease the majority of air and environmental pollution by 2025. In the Sustainable Vision (pdf), the government went as far as to promise to “have no air pollution in Ulaanbaatar city” by 2020. Those problems may be unique to Mongolia, but there’s plenty about the country’s air pollution crisis that isn’t. Around the world, and especially in Asia, urban dwellers are gasping for clean air and governments are struggling to help. Experts say what’s needed in Mongolia is a fundamental change in the city’s infrastructure and in the country’s reliance on dirty sources of energy. That means connecting all ger district houses to a central heating system; improving the city’s electric capacity; subsidizing electricity so it’s cheap enough that people can transition from coal; insulating and upgrading buildings to make them more sustainable; and moving all the coal power plants out of the city. But the government can’t afford that kind of massive investment, and Gabymbyme Haldai, head of the city mayor’s office air quality monitoring division, is irritated when I ask him about it. He says foreigners often come in to his office touting the benefits of renewable energy, but there are real obstacles to implementing these solutions. For example, Mongolia is known as “the land of eternal blue sky” because it has up to 260 sunny days in a year. So, solar panels would seem like a natural choice. But in the desert valleys of Mongolia, solar panels often get coated with dust, impacting “how well the cells are able to convert strong sunlight into renewable electricity,” according to Scientific American. There is global momentum to tackle the issue of air pollution. The United Nations’ Sustainable Development Goal 11, “sustainable cities and communities,” includes a section that calls for “sustained and coordinated government action at all levels” to reduce people’s exposure to air pollution. In the United Kingdom and Belgium, concerned citizens and activist groups have sued their governments over inaction on air pollution and climate change. Around the world, the costs of climate change are becoming increasingly clear and Ulaanbaatar offers a glimpse of the future that many cities could face. As indiscriminate consumption of fossil fuels continues to poison the air we breathe, the food we eat, and the water we drink, cities are becoming increasingly unlivable. In just a few centuries, humans have transformed them from places of opportunity into urban prisons that only a select few can afford to escape. Reversing this process will take courageous and radical action on the part of governments and businesses. If those efforts don’t materialize, millions of children will keep gasping for air.